"If you want to get rid of fleas, you need to take care of all the possible areas where these parasites can attack your cat." Outdoor flea control is essential if your cat goes outside, or if you have other animals that go inside and outside. There are safe and simple actions you can take to keep your yard flea-free and protect your cat's health. If you have a lawn, you should mow and water it regularly to control fleas. Keeping your grass short allows sunlight to penetrate and warm the soil. The heat kills flea larvae. Watering your lawn will drown any developing fleas in your yard. These basic flea control methods are safe, simple and effective. Applying agricultural lime on grassy or moist areas in your yard is another simple method you can use to eliminate fleas in your yard. The agricultural lime helps to dehydrate the fleas. Before applying the lime, you should rake up any dead leaves and grassy debris. The next thing you can do in your outdoor flea control efforts is to "sterilize" any spots of sandy or bare earth where your cat may like to sleep or hang out. Sterilize the earth by occasionally covering the spot with a heavy black plastic sheet on a hot, sunny day. First, rake up any dead leaves and grassy debris. The heat that builds up under the plastic sheet will kill any fleas and larvae in the area. If you already have fleas in your yard, diatomaceous (dye-atom-ay’-shus) earth, or "DE," is the solution. DE is a mineral substance formed by the fossil remains of prehistoric algae. It's a fine and smooth powder and it kills fleas as well as their eggs and larvae within hours of them coming into contact with it. DE is non-toxic to people and pets. You can spread the diatomaceous earth around your yard to get rid of the fleas there. The only trick is that the fleas and ticks have to come into contact with the powder, so you have to be sure to get it into cracks and other place you think the insects might be. Although they may have other issues, ants are your allies in getting rid of fleas. They eat the flea eggs and larvae in your yard. So think twice before getting rid of any ants in your yard. 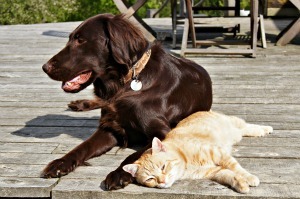 Natural Flea Control - How to use safer and natural methods to get rid of fleas.